Makeup with Bella: Taking care of the eyes area with SYLVECO! Quite a long time I've been wondering if I should write a few words about my current under eyes cream. 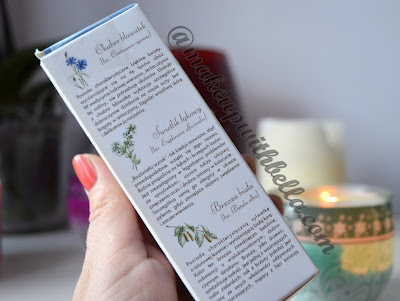 At last I decided that it is worth to do it, first because it's not easy to find good eye cream and secondly, we know the eye is the thinnest layer of skin on the entire body, and therefore the most sensitive. So using a cream made especially for eyes is crucial, especially as the age. For some of you ladies, it's quite obvious using eye cream before bed or make up application. But believe me, that not everybody does, even some make- up artists consider it unnecessary!!! I've got some experience with my last employer who the name I won't mention you, where the makeup artists or stylists don't apply any cream on the clients faces before makeup, not mentioning the eye cream!!!!!!!!!!!!!!!! Would you believe??? For me it's UNACCEPTABLE! (even if the reason is the cutting costs; at last they call themselves the professional salon lol). Ladies, using the eye cream is very important!!! Ok, after sharing with you my experience, backing to the topic of this post. 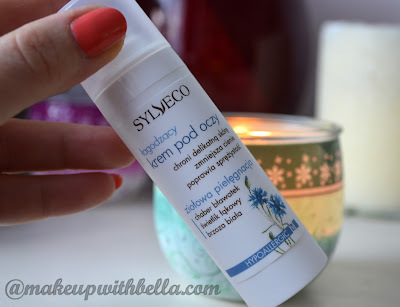 The Sylveco, Soothing Eye Cream is my current favorite. Sylveco is a polish manufacturer, who use only raw natural materials without chemical processing, its products are very rich in natural, organic ingredients and are high- quality. More from producer: " SYLVECO birch cosmetics have been developed on the basis of selected plant materials that naturally restore the youthful appearance of the skin. A prominent ingredient of our products is birch extract, containing betulin and betulinic acid, highly effective and completely safe active substances. · active birch bark extract with multidirectional beneficial effects. · they are hypoallergenic and safe for the skin." First I must say, that I don't have a lot of wrinkles (yet ;)), but I need a very strong hydration and this cream provide me the moisturize with 100%. Besides protects the delicate skin, reduces dark circles and puffiness and improve skin elasticity. We can even apply a thick layer before makeup (very quickly absorption), and the concealer or corrector won't be collected under the eyes or sear up. The consistency is very light and smooth, almost like a water, and only one pump need. I have to add, that I have very sensitive eyes and after most of the eye creams I've felt burning and have had watering eyes :(. And this cream doesn't cause me any allergic reaction!!!! Vitamin E- slows down aging of the skin, UV protection. if you live in Poland, possibility to buy stationary from here.